I am in the finishing stages of a Fulbright-Nehru grant that examines conservation initiatives in the pilgrimage town of Vrindavan, Uttar Pradesh, India. My research will offer insight into how to optimize public communication campaigns addressing conservation issues. My journey has taken me from the narrow, medieval backstreets of traditional-minded Vrindavan, to the town’s mega temples, sprawling roads and luxury housing properties, to the office buildings and affluent areas of the capital city of Delhi. In each place, I have encountered varying degrees of concern over new development projects in Vrindavan: some critique them for helping to increase the number of visitors to the town while the basic infrastructural needs of local residents remain unmet; some believe that these haphazard development projects are a sign of well-deserved “progress;” while others still posit that they damage the town’s natural environment, which needs to be protected in the name of public health, local prosperity, religion and heritage. My reverence for the environment and culture, which exists alongside a belief in the benefits of development, has baffled some who view these two concepts as being in perpetual conflict. For instance, many young and prosperous Delhiites, eager to make their mark on the world, shun traditions they associate with backwardness and narrow-minded thinking. The foreigners they have encountered have largely been from the business sector. Therefore, they are somewhat surprised that I would want to learn about the legacy of a place like Vrindavan, where the Hindu God Krishna is said to have lived 5,000 years ago. On the other hand, religious leaders and devotees in Vrindavan have found it difficult to reconcile my efforts to serve the dham (or Lord’s abode) based only on human empathy and cultural appreciation rather than on my own devotional path. Of course, I have met numerous people who are not so easily categorized. My favorites among these have been strong women who have asserted themselves and accomplished a great deal either in business, academia or conservation organizations. I have worked independently when necessary and spoken out when confronted with disrespect or hypocrisy. My strong work ethic, gained from my working-class parents, has taught me to find a way forward even in the toughest situations. My presence as a strong, independent woman has inspired respect in some, and aversion in others. Nevertheless, I think it has made me stand out in Vrindavan. The relatively free expression of my diverse interests and experiences has brought me very close to some and not-so-close to others. More importantly, however, is that in meeting such a wide range of people, I have gained much food for thought regarding who I am and how I perceive not only the world, but the role that each of us plays in it. I know that I have also encouraged the people I have met to consider these things, especially as it concerns India’s continued economic growth. This is what being a Fulbright cultural ambassador is about. It is about showing respect for the people and beliefs Fulbrighters encounter and acting in a responsible manner. It is also about appreciating the identities of those we meet while expressing our unique American identities so that stereotypes and assumptions can be transformed by a more nuanced understanding of nations and cultures. My advice to Fulbright applicants is to choose a research topic that will allow you to come into contact with people from various backgrounds, and will offer opportunities for you to contribute something positive to their communities. This not only fulfills the goals of the Fulbright Program, but is also highly rewarding. For example, my work, which favors no particular organization or sect, has earned me friends from all over the world (including Vrindavan, of course) who congratulate me on my endeavors to gain a detailed overview of problems involving local conservation. Contact as many local organizations and public stakeholders as you can before applying and mention any possible volunteer or liaison opportunities in your application. This can help to make the application process fun. First and foremost, though, talk with friends and family. Seek the advice of those who know you best as you compose your personal statement – and maybe someone who doesn’t know you so well. Your statement should sound like you and give the review committees a very clear sense of who you are. Serious thought should be given as to why you wish to work in your chosen Fulbright country, what unique personal characteristics or experiences you can contribute, and what you hope to gain from the Fulbright experience in terms of personal, academic and professional development. Top photo: Katie Walter, 2009-2010, India, in the home of Gopal, a young boy whose siblings attend the Sandipanimuni Charity School in Vrindavan. 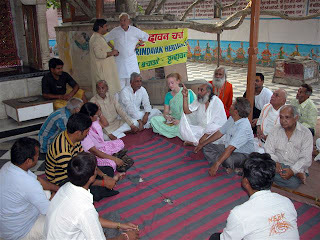 Bottom photo: Katie Walter, 2009-2010, India (center, in green sari), attending a meeting of the Braj Vrindavan Heritage Alliance, an open forum for local stakeholders to discuss and act upon environmental and development issues.